Vertebrates are all the animals with backbones, the fishes, amphibians, reptiles, birds, and mammals. These animals have attracted a great deal of study. The efforts of generations of vertebrate palaeontologists have been repaid by the discovery of countless spectacular fossils: the heavily armoured fishes of the Siluro-Devonian, seven- and eight-toed amphibians, sail-backed mammal-like reptiles, early birds and dinosaurs with feathers, giant rhinoceroses, rodents with horns, horse-eating flightless birds, and sabre-toothed cats. These fossils tell us where the living vertebrates have come from, and they show us glimpses of different worlds that seem so bizarre that they would defy the imagination of a science fiction writer. Despite all of this information that has accumulated over the past 200 years, the origin of the group is hotly debated. One thing is clear from examination of living animals. The vertebrates are members of a larger group, termed the Phylum Chordata, and their closest living relatives are marine animals such as the sea squirts and amphioxus (see below). 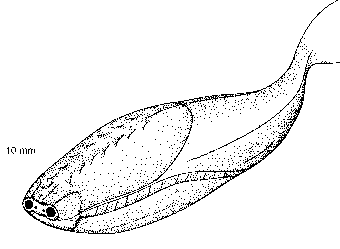 These creatures do not have bone, one of the characters of most vertebrates,but they share other features, such as a notochord, a flexible tough rod that runs along the length of the body down the back. 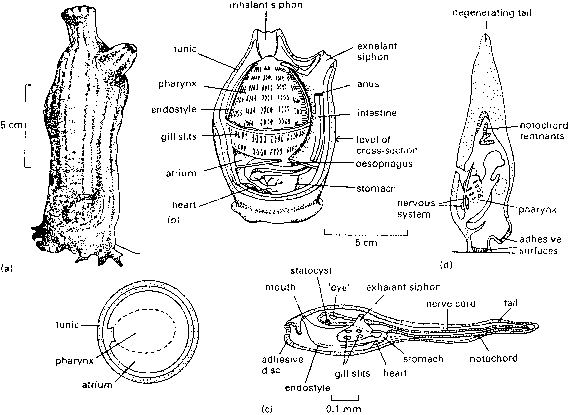 The notochord in living chordates is generally made from an outer sheath of collagen, a tough fibrous connective tissue that encloses turgid fluid-filled spaces. Chordates also have V-shaped muscle blocks (myomeres) along the length of their body. The question about the origin of vertebrates then broadens out to focus on the origin ofchordates. were wrong, and that the fundamental splits in the tree of life were all among Bacteria, separating the two major groups Bacteria and Archaea. 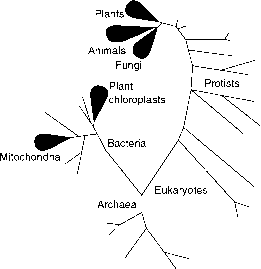 The familiar plants, animals and fungi are part of Eukaryotes, the major group characterized by complex cells with a nucleus, relative late-comers in the broad scheme of things. Modern studies (e.g. Nielsen et al., 1996) confirm that a major clade within Metazoa, the animals, is Bila-teria, supported by both morphological and molecular evidence (Eernisse and Peterson, in press). The Bilateria includes the bilaterally symmetrical organisms, comprising three clades: Lophotrochozoa (brachiopods, phoronids, annelids, molluscs and many minor groups), Ecdysozoa (arthropods, nematodes, pria-pulids and some minor groups) and Deuterostomia (echinoderms, hemichordates and chordates). The origin of vertebrates has long been a profound mystery, but now some clarity is emerging. The purpose of this chapter is to explore the various lines of evidence that can be used to reconstruct the story of the origin of the vertebrates: the study of modern animals that are vertebrate-like in some features, the study of molecular relationships, and fossils.